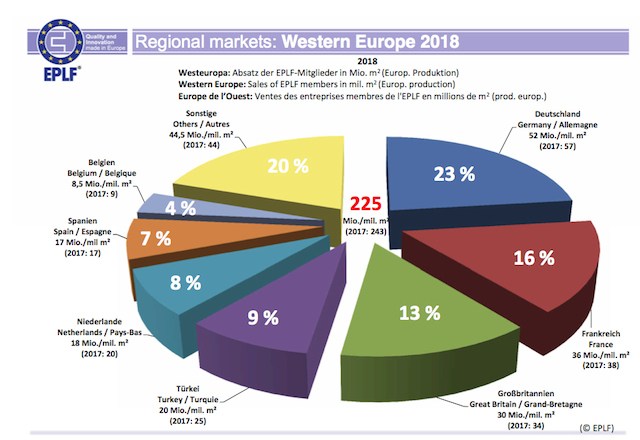 In 2018, manufacturing members of the EPLF achieved worldwide sales of European-produced laminate flooring totalling 455 million m2 (2017: 477 million m2, which corresponds to -4.6%). This indicates that even with a downward trend in some regions, the global laminate market remains at a high level. In Western Europe, the “home market” of the EPLF, sales declined further in 2018, whilst Latin America and Asia once again recorded the biggest increases. North America saw a reduction in sales, whereas Eastern Europe remained stable. -7.3% compared to the previous year. Germany was still by far the most important individual market in Central Europe with 52 million m2 (PY 57 million m2) – albeit with a -8.3% reduction caused by the continuing trend towards substitution with alternative flooring types. France continues to occupy second place in Europe, declining slightly in 2018 with 36 million m2 (PY 37.6 million m2). Unfortunately, the positive trend for EPLF members did not continue in the United Kingdom: at 29.8 million m2 for 2018 (PY 33.8 million m2), a further reduction of -11.8% was recorded. This puts the UK in third place again for sales in Western Europe – ahead of Turkey, where laminate revenues for the Association continued to decline in 2018, falling -18.2% down to 20.4 million m² (PY 24.9 million m²). The Netherlands stands firmly in fifth place with sales figures of 18.3 million m² (PY 19.7 million m²). Once again, Spain follows on behind with a stable outcome of just under 16.5 million m² (PY 17 million m²). North America continues to be a profitable sales region for the European laminate flooring sector, although weaker figures from Canada have had a somewhat dampening effect on the result. At 44.3 million m2 (PY 49 million m2), total sales for North America in 2018 stand at around -10.4% down against the previous year. With around 30.7 million m2 sold in 2018 (PY 32 million m2), the USA exhibited a slight reduction of -2.4%, whilst Canada recorded just under 13.6 million m² for 2018 (PY 18 million m²), representing a drop of -24.5%. The biggest increase in 2018 was 7.8%, gained in Africa, although total sales there only amounted to 5 million m². 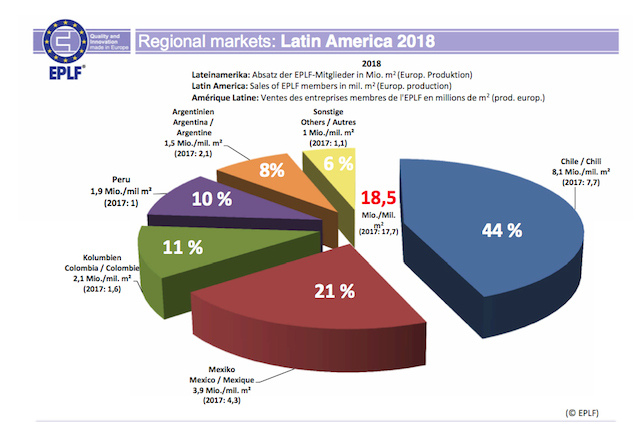 The region of Latin America again recorded an increase in EPLF sales statistics, achieving a growth rate of +4.7% for 2018 with 18.5 million m2 (PY 17.7 million m²). Sales figures for Chile, the largest individual market, rose by +5% compared with the previous year, standing at 8.1 million m² (PY 7.7 million m²). Mexico recorded 3.9 million m² (PY 4.3 million m²), Columbia registered 2.1 million m² (PY 1.6 million m²), and the poor economic situation in Argentina led to a downturn to 1.5 million m² (PY 2.1 million m²). 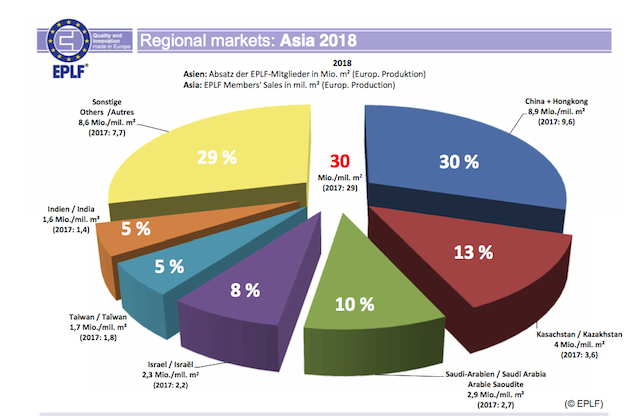 In the Asia region, EPLF producers achieved total sales of around 30 million m² (PY 29 million m²) in 2018, representing a rise of around +2.8% over the previous year. The uncontested number one position for Asia in 2018 was again held by China (including Hong Kong), although figures were down -7.2% compared to the previous year: sales there reached 8.9 million m2 (PY 9.6 million m²). 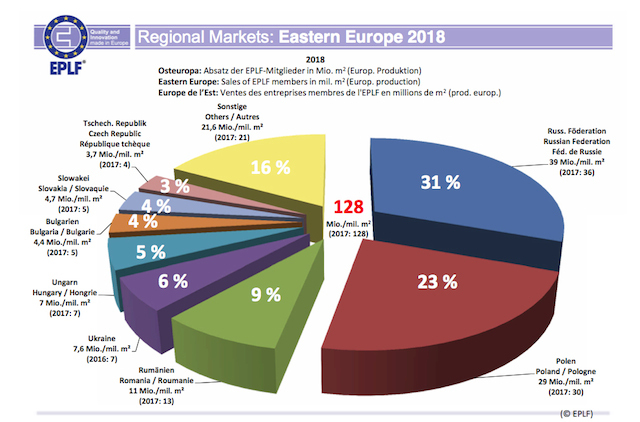 The EPLF is encouraged to see ongoing growth in Kazakhstan, where market data has been gathered since 2016: 4 million m2 sold (PY 3.6 million m2), an increase of +11%. Israel attained 2.3 million m² (PY 2.2 million m2), Saudi Arabia rose slightly with 2.9 million m² (PY 2.7 million m2); behind this lies Uzbekistan with nearly 2.1 million m² (previous year 0.8 million m²) followed by Taiwan with 1.7 million m2 (PY just under 1.8 million m2) and Azerbaijan with 1.6 million m2 (PY 0.9 million m2). 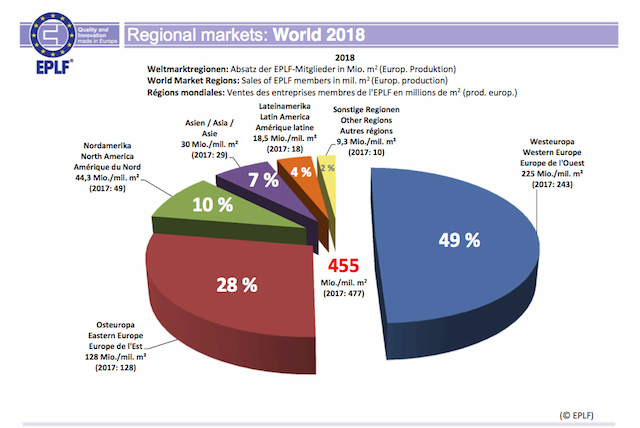 Meanwhile, it appears laminate has also gained a foothold in the huge Indian market: in 2018, EPLF members achieved sales there of 1.6 million m² (PY 1.4 million m²).